What will the crowds at Walt Disney World in 2017? That’s a good question. 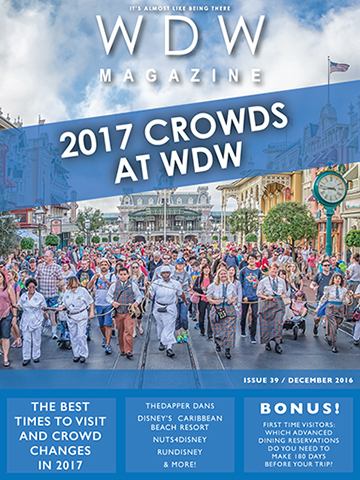 Welcome to the 2017 Crowds at WDW issue! We have everything you need to know about crowds at WDW in 2017. We even have predictions from two of the top Disney World crowd “experts”. Check this out. Will 2017 be as crazy crowd wise as 2016? That’s the question for our Disney World crowd “experts”, Dave Shute from yourfirstvisit.net and Carl Trent of Dad’s Guide to WDW. You get to see their predictions month by month. Will it be busy in October? These guys know. We also look at what’s coming in 2017. Will we see Pandora? Rivers of Light? Any new Star Wars attractions? It’s in our What’s New in 2017 article. Finally we look at how the new Value, Regular and Peak seasons will work. This month’s Helping Hands section starts with a look at which restaurants you will need to make reservations for at the 180 day mark. The we look at the new Early Morning Magic at the Magic Kingdom. Should you splurge or not? Have you ever been to the Top of The World? We’re talking about the Top of the World lounge in Bay Lake Tower. It’s really cool. Come over and take a look. This month the Best of WDW takes a ride on the Liberty Belle Riverboat. Talk about fun! Then we head over to the Caribbean Beach Resort and talk about 10 reasons why we love it. Then we pop over to the Magic Kingdom and eat at Cosmic Ray’s Starlight Cafe. Some good food and out of this world entertainment. Finally we head over to the Launch Bay Cargo gift shop to look at the cool movie memorabilia that’s there along with some really neat souvenirs. Nuts 4 Disney gets Section k! off to a fun start with an interesting question about how to pay for a Disney vacation. The Parks kids wrap up their Christmas tour of the holiday storytellers at Epcot. The Bring the Magic Home craft project for the month is making a countdown chart from recycled K-cups. We’ve also got some cool downloads that will keep the kiddos quiet for a while. The Fanzone is pretty interesting and yummy this month. 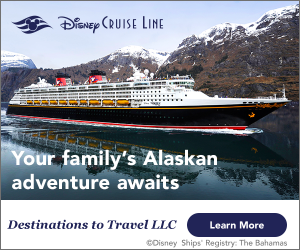 It kicks off as we look some questions about how you plan vacations to WDW. Then we share the recipe for Cottage Pie at Rose and Crown. The Vinylmation Corner looks at runDisney Vinylmations and the Tsum Tsum Corner looks at the year in review. Have you ever done a runDisney event? Check this out. Follow contributors Kelly and Casey as they talk about the process of getting ready for running in one of the runDisney events. Around the World is packed this month. There is a lot, a whole lot of news coming out of Walt Disney World. From the opening of PizzeRizzo to MagicBand2 and a new Christmas Tree exhibit in Disney Springs. Next we look at the Dapper Dan’s. Who doesn’t like some good music? Did you know that over 30,000 people per day visit Epcot? How about that 1.5 million passengers ride on the Walt Disney World Railroad in the Magic Kingdom. We’ve got a bunch of fun crowd facts in Did You Know. This is a big issue. It’s an important issue. Don’t miss this one!